Vines can be great additions to any garden, and you can shape them into almost any form since they are so flexible. This means they can add interest and character to your landscape in a variety of ways. Feel free to use your imagination and incorporate vines into your garden however you like, but if you need a few ideas, the following suggestions will give you a jump start to a fabulous, vine-filled garden. 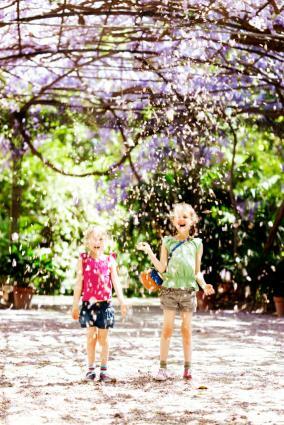 Wisteria is the best overall choice to create the effect of a petal shower. Once established, however, the waterfall of purple petals will commence in early summer each year, creating several weeks of child-like delight in the garden. Build the trellis in full sun, aiming for at least 100-square feet of growing space, and build it sturdy because wisteria vines weigh hundreds of pounds when they are mature. Climbing hydrangeas and climbing roses can also be used to create the petal shower effect, and they don't need such a massive arbor to support them. However, it's tough to beat the beautiful display created when wisteria petals begin to fall. 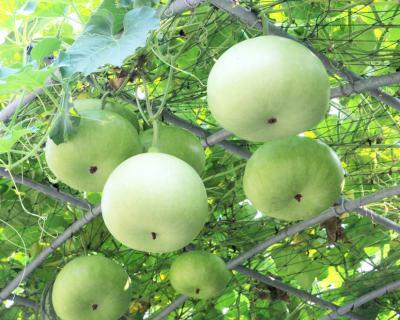 Calabash gourds are especially decorative hanging overhead from a trellis. However, any edible vine would yield an equally magical effect, such as grapes, kiwi, passion fruit, or even just ordinary pole beans. The necessary strength of the trellis depends on the chosen vine. Pole beans are light enough to be supported by string, while grapes need a massive wooden or steel structure. Use the approach over a patio, on a backyard pergola, as a tunnel-length arbor, or as an awning-like extension from the house. All edible vines require full sun to fruit. Small, shade-loving vines offer a great way to spruce up and beautify the trunk of a large shade tree. Consider clematis, honeysuckle, jasmine, vinca, or climbing hydrangea, which all have a modest growth habit and sport gorgeous flowers and foliage. 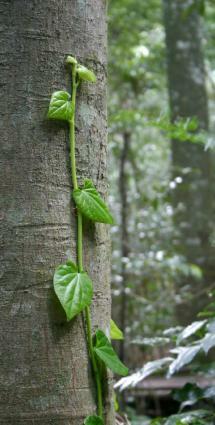 Stay away from aggressive shade vines like ivy since these vines will grow right into the canopy and smother the tree. If there are no lower branches for the vine to grab onto, you can drive a few stakes into the ground near the base and stretch wire between them and the lowest branches to create a support system along the trunk. Just be sure to wrap a piece of rubber from an old garden hose or inner tube around the wire that goes to the branch to prevent it from gouging in to the bark. Grapes, wisteria, bougainvillea, climbing roses, and trumpet vines have such thick woody stems that they can be trained into a tree-like form with a self-supporting trunk. The vines will need stout structures to get them started, and a single wooden or steel post with several horizontal supports works well for this purpose. Train the vine to the post, and cut it back to the main trunk every year until it becomes thick and woody. The support can be removed eventually, and the vine-tree will stand up on its own. However, this could take a decade or more. Alternatively, if you already have a massive old specimen growing on a conventional trellis, you can cut it back to the main trunk and remove the support. The key is to cut back the new vines that grow from the main trunk and "branch" each year. 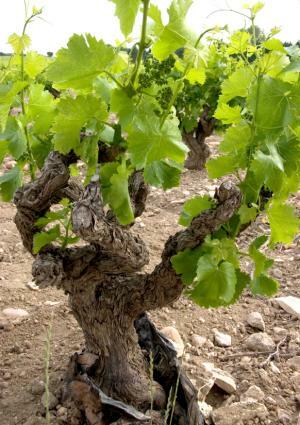 Vines trained this way have a wild, gnarled look that is visually striking, to say the least. Growing multiple vine varieties together sounds like it could be a chaotic mess, and it could be, but not if you plan it in advance as a beautiful botanical arrangement. The sure-fire way to end up with something stunning, rather than an eyesore, is to work with species that come in several different colors, such as pink, white, and orange bougainvilleas. Plant them right next to each other, whether in the ground or in a pot, and make sure the trellis is strong enough to support all of them at once. 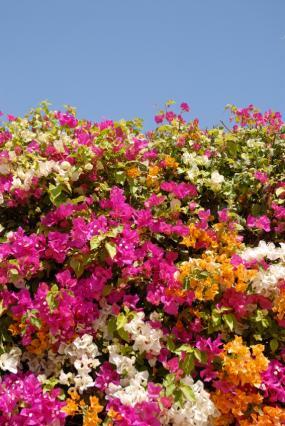 There is more to landscaping with vines than just finding a pretty trellis or arbor to train them on. Their innate flexibility lends them to many other creative uses. With a little ingenuity, you'll find dozens of extraordinary ways they can be used to add beauty and interest to your landscape.